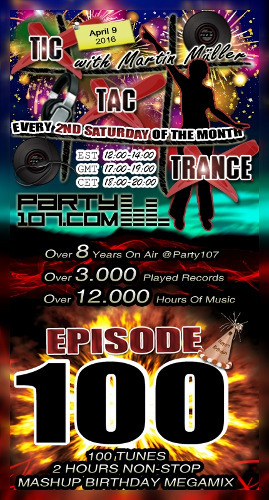 This Saturday April 9th marks the 100th episode of Tic Tac Trance with Party107 resident Martin Mueller! Tune in for a very special 2 hour mashup megamix featuring 100 hand-selected tracks from TTT episode 1 all the way to episode 100 to celebrate over 8 years on the air! Episode 100 starts Saturday at 12:00 PM Eastern USA / 18:00 CET / 17:00 GMT.